Reviews - Book the Bike Bus! 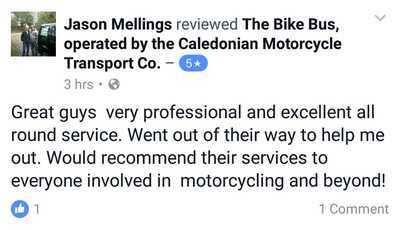 A very professional friendly service by a friendly driver who obviously cared for bikes. I was very hesitant at first trusting my bike to anyone to travel over 200 miles. However the service was second to none and would strongly recommend them. Great service, clear communication with both seller and buyer, decent price, well equipped van to ensure safety of the bike. Very happy. 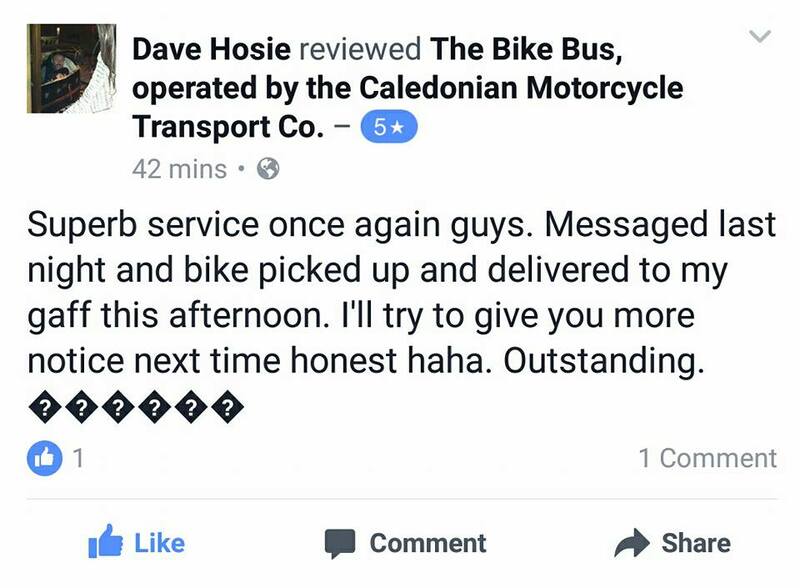 Excellent service, bike arrived safe and sound. More than pleasant courier and professional from start to finish. Will certainly use again should I ever need another bike shipped. Very happy with the service provided.They were very helpful and provided a fast and efficient delivery. Thank you. 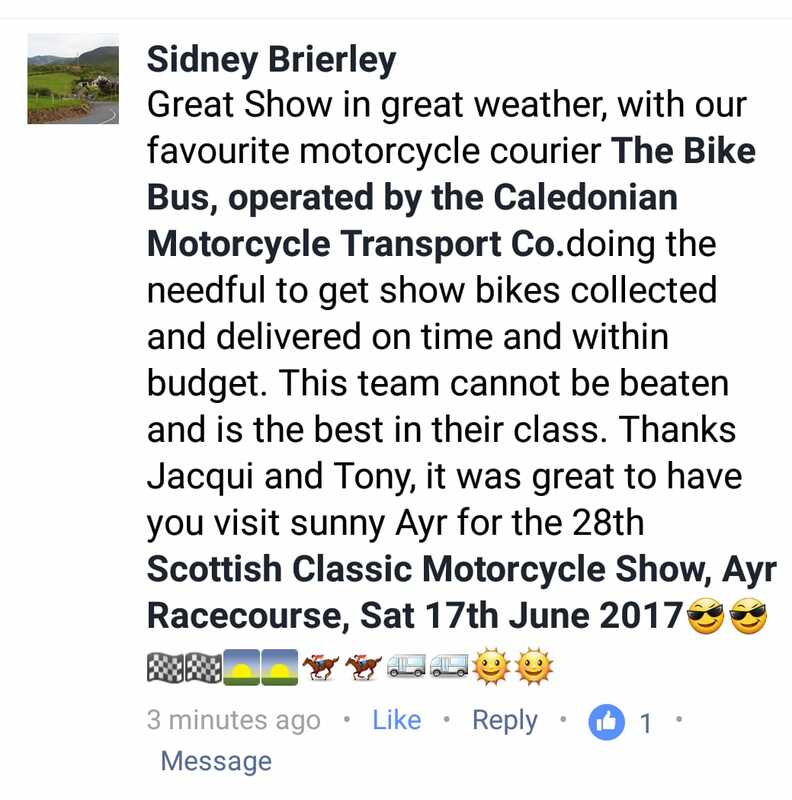 A really good service and very good transport area with separate storage for the bikes. Fantastic service. Great communication from start to finish. Friendly. 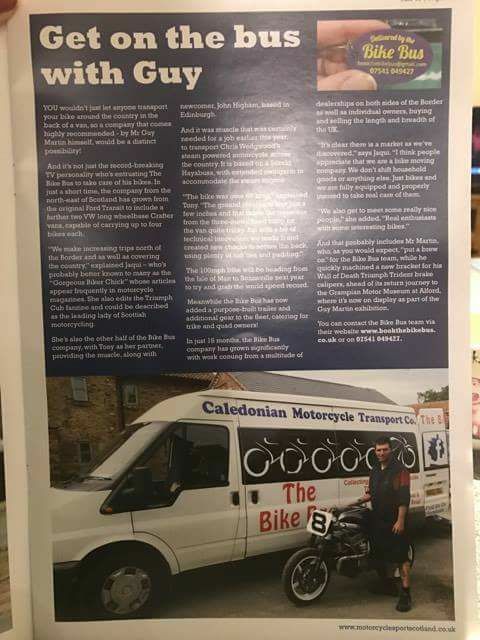 I felt my bike was in very safe hands. I am already recommending them. For a 660 mile round trip I couldn't make I would recommend the Bike Bus to everyone, great price, contact and friendly, most of all saw my new bike safely to its new home, even if we didn't quite make it up the curb! Thanks guys. 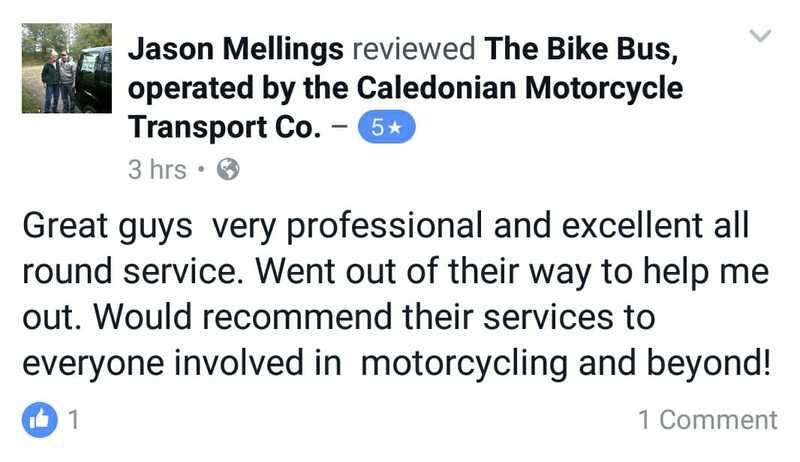 Highly recommended, superb quick service at a fantastic cost. Very helpful and professional service! Many thanks! Excellent customer service. Managed to work around time constraints at the pick up point and even managed to deliver bike well before I expected. Driver was extremely friendly. Wow - what a superb service! 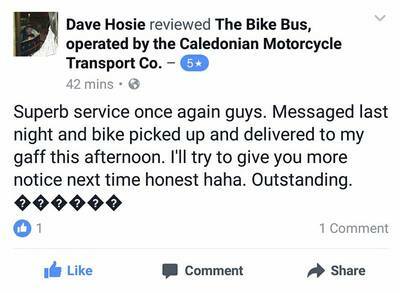 V impressed by The Bike Bus who kindly picked up our moped within the day of quoting and delivered it as the shop opened the following day! It was a prompt, reliable, informed (we were kept up to date at every stage) and friendly service. Would certainly recommend. Excellent service. ...would recommend. ...friendly/fast/safely delivered. ...no worries. Excellent service. 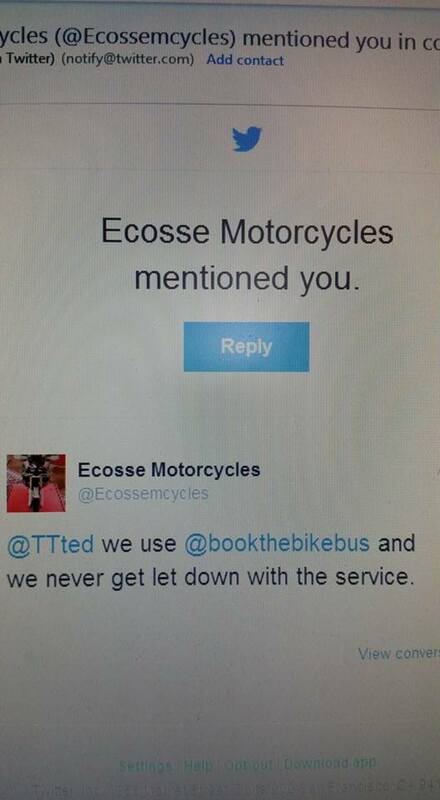 Fast, easy communication from these guys and a hassle free service. This is a company that also seems passionate about motorcycles, so rest assured your bike is in safe hands. I will definitely use in the future. Brilliant service - did exactly what they said they would do. Really good service & good communications. Proper stands & straps used to secure bike so the bike arrived unmarked. Did everything he said he would. Will definitely use them again. Excellent Service, Five star communication, would highly recommend. Thanks Again Tony & GBC. Tony was very friendly and I was happy to let him transport my bike. Would recommend to use him. Kate, Piagio Vespa LX125. Tony was very accommodating. He was held up by traffic but did keep me aware. Pricing was reasonable and no issues with delivery. Much appreciated. Would definitely use again. Betty, Suzuki Bandit. 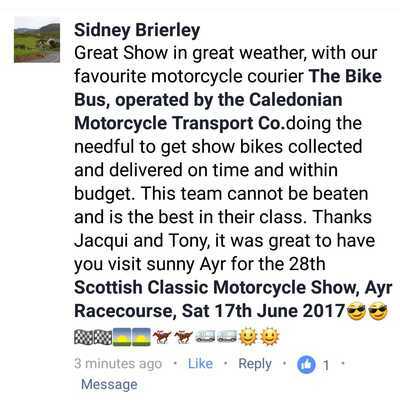 If you need your bike moved with the least amount of bother, than these people are who you should contact (Tony). None of this 2-10 working day notice nonsense. They have the properly equipped van and nothing is too much trouble. Tony, Suzuki Bandit. Although not the cheapest (not by much), I chose The Bike Bus and I'm glad I did. There was great communication throughout, from the initial quote, to agreeing and confirming the collection and delivery times that were convenient with both me and the seller, to the actual delivery day and giving an ETA. Tony arrived in a van that had all the correct gear you'd hope he'd have when looking after your bike. 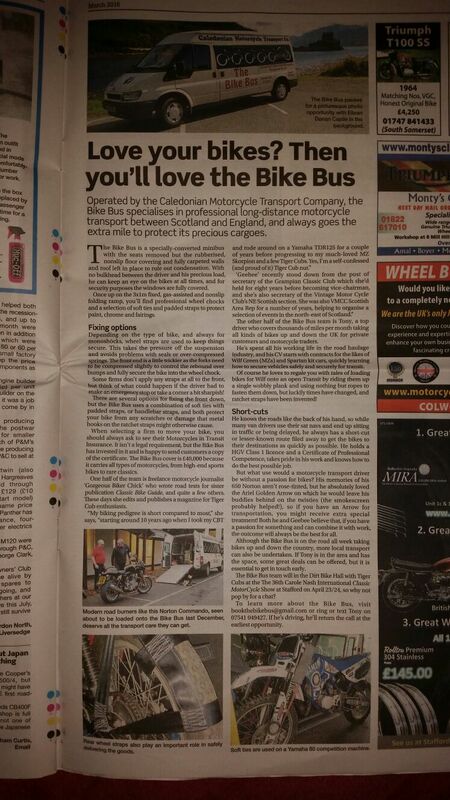 I'd thoroughly recommend The Bike Bus without reservation and would use again without hesitation. CBR400. 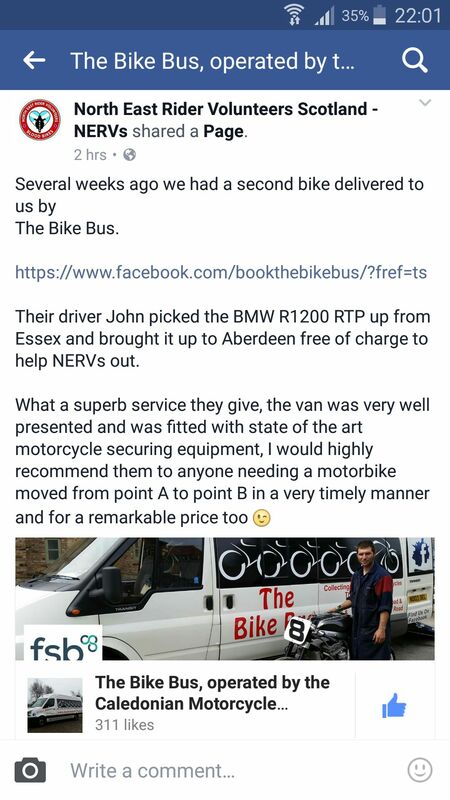 Top service, great communication, very well organised van for transporting bikes. Exact pickup / delivery times agreed and delivered. Would not hesitate to use again. Thanks again Tony. Aprilia Tuono. Excellent service, very good communications. Couldn't ask for more. Vectrix.